Anil Bhasin is a realtor for the last three decades. His ‘Ghar” brand is extremely popular amongst Canadians of Indian origin. Mr. Bhasin is a yoga enthusiast who was instrumental in getting Baba Ramdev to Canada in 2007 and was actively involved with the International Yoga Day Canada. 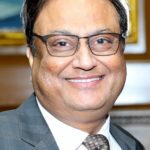 He is a proactive philanthropist who was actively involved with the Million Dollar Pledge that the Indo-Canadian Friends of Osler made to donate $1million to the William Osler Foundation, the Sunnybrook Hospital.